This gorgeous, private mountain chalet is built with huge timbers and a massive rock fireplace. The eastern wall of the living area is composed of wall to wall windows facing the magnificent cliffs in the distance. The oversized master bedroom is on the main floor and consists of its own large sitting area with a TV. The master bathroom is in the adjacent hallway and includes a jetted bathtub and a nice shower. From the living area take the spiral staircase to the gorgeous loft area. The loft area has a living area with a large LCD TV and soft chairs, sofa etc. Neighboring the loft area is the upstairs private bedroom and bathroom. This private chalet is only 5 minutes from the Durango city limits and is located on a quiet, county road great for walking, jogging and biking. Your backyard is directly below the incredible Animas rock climbing area, great for technical rock climbing or easy hiking. 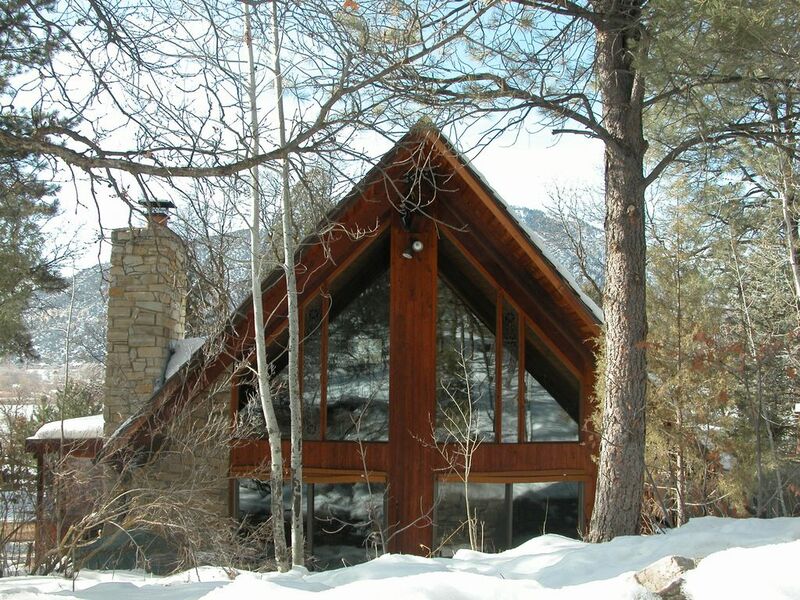 This private property is abundant with majestic Ponderosa Pine trees and wildlife. There are many attractions for a visitor to enjoy such as the amazing cliff dwellings at Mesa Verde National Park only 30 minutes away and skiing only 20 minutes away. Relax at Trimble Hot Springs after a long day of skiing or hiking. Enjoy access to a private tennis court and high speed internet! Hillcrest city golf course with views of majestic peaks 10 minutes away, Dalton Ranch semi private course in the river valley is 7 minutes away. Glacier club is 20 minutes away, 2 great Mt. courses. We came with our two kids for spring break and had a great time. We really enjoyed the picture windows and watching the deer and turkeys walk up the snowy hill each day. The fireplace was perfect for cozy evenings and the kids loved taking over the entire loft space upstairs. Lana thought of all the little things and left clear instructions for where to find things and how to work everything in the cabin. The location was the perfect balance of seclusion, yet close enough to run into town for activities etc. The only things we thought could be improved were the lighting and the amount of stuff. There were plenty of lamps but even with the big windows it often felt like we needed more light (particularly over the dining room table). The place is sweetly decorated, but we had to move many of the decorations out of the way, either to be able to use that surface (kitchen/dining and bathrooms) or so the kids wouldn't get them (upstairs). Overall, those were just minor complaints and everything else was great for the trip! Thanks for the wonderful review on the Chalet Elena! Its a pretty special place.. I'm happy to hear you and your family enjoyed your stay and I hope to welcome you back in the not too distant future! We rented the chalet for 4 nights and our daughter and her boyfriend were with us. The chalet was immaculate when we arrived and we felt comfortable right away. The view out the living room is beautiful and we enjoyed the quiet and the views. We are from Phoenix and we wanted a great little mountain getaway and it couldn't have worked out any better than it did! Thank you Lee for the very nice review. I'm happy to hear you and your family enjoyed the Chalet and your experience in Durango. The Chalet is a pretty special place! I hope to be able to welcome you back to the Chalet or one of our other five homes on County Road 250 in the not too distant future! My wife and I had a wonderful time. Close to town but a very quiet place. It has everything you need. We will be going back. We loved the chalet. It was quaint and perfect for our family vacation - well appointed and conveniently located near Durango and lots of surrounding activities. One thing we particularly loved was the altitude at this chalet is < 7000 feet so if you have any family members who tend to suffer altitude sickness this is a perfect situation to meet the old saying "climb high, sleep low". We did hikes and day trips above 9000 feet but being able to come back to the chalet and sleep below 7000 ft was very helpful. There is an amazing hiking area directly off the property as well. We stayed in this Chalet while visiting our son in Durango the week between Christmas and New Year's. The chalet was located just outside of town, but had an isolated country feel. My son and his pup stayed with us and he had a less than 10 minute ride to work on Main St. We enjoyed every bit of this home; I'd love to rent it again in the summer to enjoy the deck and screened in porch. Thanks Lori for the great review on the Chalet! I hope to be able to welcome you and your family back to the Chalet or one of our other five homes along County Road 250 in the not too distant future. Very best wishes for a happy, healthy 2018! The chalet was spacious, extremely clean and had all the amenities needed for our weeklong stay. Our children especially loved having the upstairs loft and bedroom to themselves. The large windows in the main living area offered a beautiful view of the mountains, and we enjoyed exploring and hiking around the property. The chalet offers a sense of seclusion while still being close to town. While the lack of snowfall limited some of our planned activities, we were able to make many memories during day trips to Ouray and Pagosa Springs and a ride on the Polar Express. We do much fun, we are already talking about planning another visit. Thanks Chris for the very nice review on the Chalet. I'm happy to hear you and your family had such a great time in Durango. I'll look fowardr to welcoming you back in the not too distant future!